Dallas Cowboys Riddell full size replica white throwback style helmet autographed in black paint pen by Hall of Fame quarterbacks Troy Aikman and Roger Staubach, and they added HOF '06 and HOF '85 to their signatures. 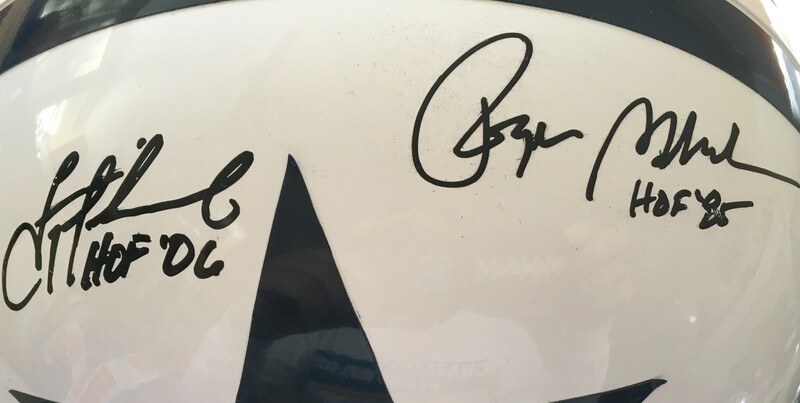 NOTE: both signatures have very minor flaws noticeable only upon close inspection. 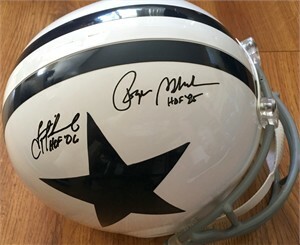 Obtained at a paid signing with GTSM, with Aikman's personal hologram on the helmet and certificate of authenticity from AutographsForSale.com. ONLY ONE AVAILABLE FOR SALE.